You either love or you hate Final Fantasy 12, and you either love or you hate the somewhat recent trend of remastering old games to squeeze a few more drops of profit out of them. I'm currently playing the remastered PS4 version of Final Fantasy 12 ("The Zodiac Age") and it's still the same old nonsense story about fantasy imperialists and magic crystal macguffins. One thing that surprises me, though, is how this remastered version actually looks worse -- it went from the apex of PS2-era 3D art to looking like a mediocre PS3 game running on a PS4. 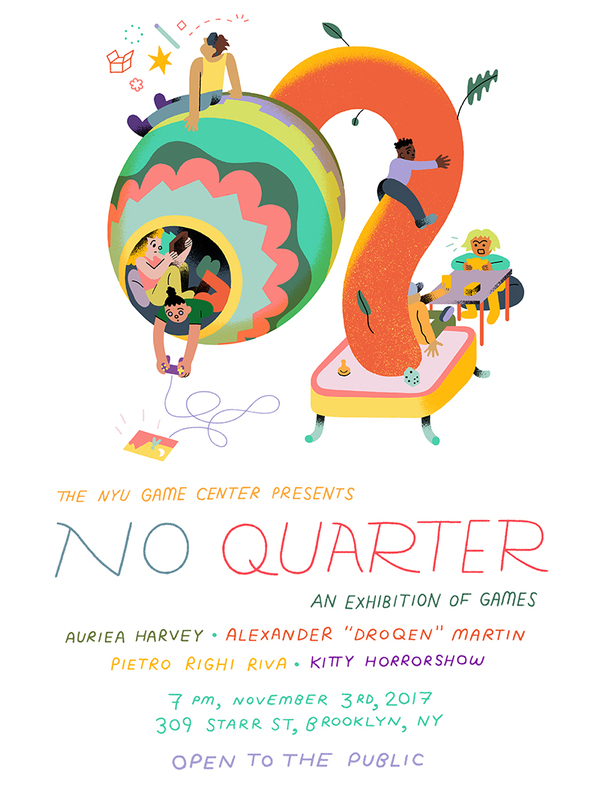 A short while ago we announced the date and lineup for No Quarter 2017: it's on November 3rd at the Starr Space Gallery in Bushwick, Brooklyn, featuring new commissioned work by Auriea Harvey (of Tale of Tales), Droqen, Pietro Righi Riva (of Santa Ragione), and Kitty Horrorshow. We'll be flying out all four artists for the show, so if you attend, you'll be able to meet them and talk with them at the event. For 8 years now, the No Quarter Exhibition has been paying game designers to make the games they want to make, and then throwing them a big fun party to celebrate and amplify their unique voices. We claim no ownership over the resulting work — we just want these artists to speak their mind, and so we give them space and support to do that. We think it’s a pretty great deal for them, but we also get a lot out of it: their act of creation, and our shared acts of play, help strengthen our communities. Now, we do all this at a time when many people think we should isolate ourselves from the rest of the world — but we know that’s a very destructive attitude. It’s so destructive that, for the first time in the history of No Quarter, we are temporarily suppressing our vocal and insufferable belief in our city’s exceptionalism: this year, we are commissioning only artists based outside of New York City. We believe a wider diversity of backgrounds and identities can only enrich our understanding of art and community… oh, and it helps us make better games too. Like a lot of digital artists today, I learned Photoshop in the late 90s in order to make awesome-looking fan sites and "professional" forum signature images. One of the Photoshop tricks I learned was the "Bevel" layer style, which embosses a faked thickness and depth onto a layer, as if it's popping outward toward / inward from the viewer. When I first learned it, I felt powerful, like I could use Photoshop to "paint in 3D" and make my Starcraft fan forum avatar look even more professional. But then I realized that the bevel had a very specific look to it, and I started seeing that look everywhere. My astounding bevels quickly lost their sheen. To this day, the conventional wisdom in 2D game art is that you should just handpaint your own bevels, and it only takes a few minutes when you get good at it anyway. 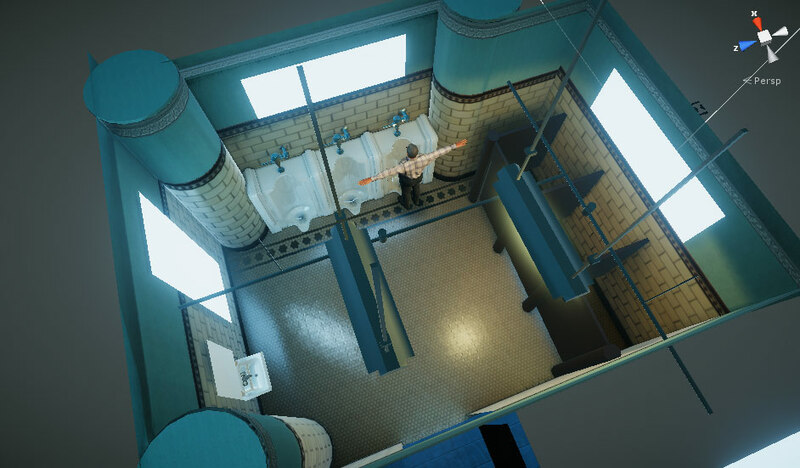 A lot of my games have been what I'd call short form "one room" games, where I constrain the scope of the game to one room or one small area. When I first started doing Radiator 1 ("Polaris") in 2009, that constraint emerged from my frustration with working on a large international group project like Black Mesa Source, where I wasn't sure if we were ever going to finish and release anything. I wondered, could I work alone, and quickly make a short experience in a small room? But I also don't exist in a vacuum, cut-off from the rest of video game culture. Maybe my attitude is also a reaction against the rise / dominance / golden age of open world games and walking simulator-type hiking games today? 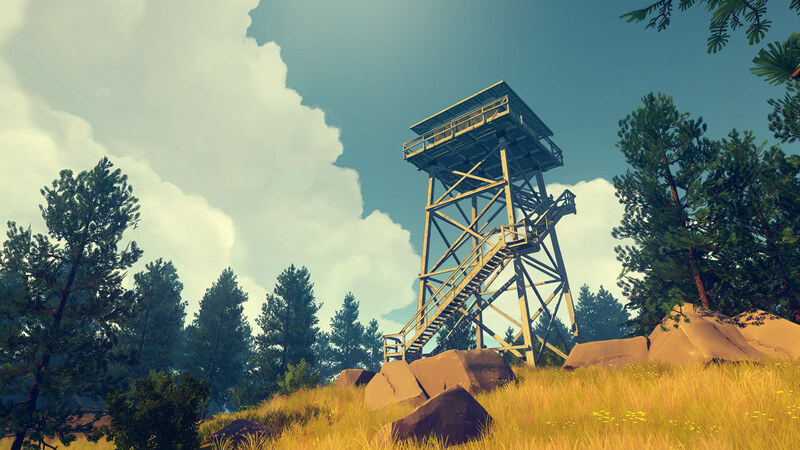 I know other designers counter AAA hegemony in different ways, like how Firewatch adopted a non-photorealistic illustrative art style, or how The Signal From Tolva focused on a somewhat sparse rocky-chunky-sculpted look. Both games feature large open world environments that differentiate themselves with talented art direction that also helped them scope better too. However, I'm not really a good art director, and I still feel really tied to realism for political reasons, so I guess I have to differentiate my creative strategy in a different way... I specifically set my games in small man-made domestic spaces instead of trying to build huge sweeping landscapes. And even if I did attempt to build a huge landscape, my shabby default Unity 2 tri indie grass will never be able to compare with photoreal translucent Unreal grass, or Breath of the Wild's lush Miyazaki grass, so maybe that's why I don't bother. As much as I enjoy and admire all these grass games, I recognize that it's out of my wheelhouse and capability. Instead of trying to build a giant grassy forest landscape, I can rest with a decently crafted urinal and lean on that. By constraining the physical-geographical space, I think that helps me explore a wider conceptual-cultural space. One room doesn't just mean one idea? Or if it does, then for now, I think I'd rather make 5 one room games than 1 five room game, or 0.271 forest games.